It’s a pawsome day, #UberPUPPIES are in town! Yes, you read that right, today could pawsibly be the best day ever! We’ve teamed up with Purina’s Pets At Work mission to bring UberPUPPIES to 8 cities in Australia. Not only has it been scientifically proven that the furrier your colleagues, the less stressful and more productive your workplace is, but we’re also working with local animal shelters to find new homes for our furry friends. It will be anything but business as usual when these adorable canine-didates from animal shelters across Australia visit your office! Open your Uber app between 12pm and 4pm. If puppies are available, you and your colleagues will enjoy 15 minutes of puppy love. It’s just a $40 snuggle fee and Uber and Purina will in turn support participating animal shelters. Plus, all lucky puppy recipients will get an Uber and Purina gift bag. Found the perfect canine-didate? All puppies will be up for adoption. 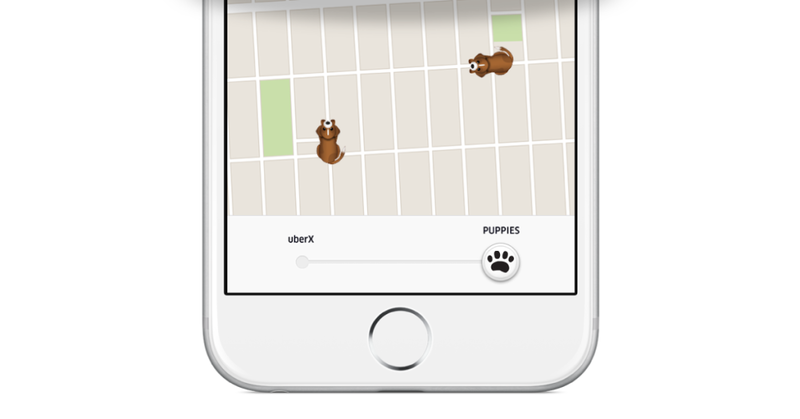 UberPUPPIES will be available on Thursday, 25th February from 12pm – 4pm (local time) for office deliveries in CBDs nationally. DEMAND FOR PUPPIES WILL BE HIGH & AVAILABILITY LIMITED. Can’t get puppies? Don’t terrier self up. Keep trying as we’ll be working ourselves to the bone to deliver as many puppy snuggles as possible. Snuggle fees will be charged to your Uber account. Remember, Uber will in turn support your local participating shelter. Shelter representatives will also be available to accept cash donations during puppy visits. Donations given to the shelters may be tax deductible. Please check with the shelter representative. If you require a tax receipt, ensure your details are noted. All successful requesters will be subject to a series of screening questions for puppy safety. Make sure your boss and building is cool with the furry addition to your team and that no one is allergic. A dedicated enclosed puppy playroom is necessary. Check out Purina’s Pets At Work tips. All UberPUPPIES are up for adoption! Just ask the local shelter representative for more information. When we launched #UberKITTENS last year, dozens of kittens found new homes. Some users may incur a $1 AUD verification charge when making a request. This is reversed as soon as verification occurs. If you miss out on Uber & Purina’s #UberPUPPIES you can still make a pawsitive impact by visiting your local shelter, donating online, and spreading the word about pet adoption on social media. Named Sam? Know a Sam? We’ve got a ride for you!